Find out how to get to central London from London’s main airports with our guide to London Airport Transfers. London has six main airports: Stansted, Luton, Heathrow, Gatwick, London City and Southend On Sea. Each one of these airports has direct connections to central London. London City Airport and Heathrow are inside the London Travel Zones and are directly linked to the London’s underground network. All the other airports are located outside the London Travel Zones, and are therefore not linked to London’s Underground network, but other types of direct airport transfers are available to reach central London from each airport. For private airport transfers from London’s airports to central London we recommend booking a Minicab. This way, you can book in advance and pay a fixed price, not having to depend on a taximeter, so even if there is traffic you will not pay more than the agreed amount. You can also compare different minicab companies easily and choose the one that you most like by using a comparison website such as Minicabit. and you can get £5 discount if you use our promo code “qverlondres5”. An increasingly popular option is to book shared airport transfers from London’s airports to central London. Many private transfer companies are offering this service, and basically they will have taxis, minicabs or even minibuses that make several trips from the different airports to central London throughout the day. If you choose this option, you may share the vehicle with other passengers who have also booked this option and need it for the same time, or you may find that no one else has booked that exact time and travel on your own. The driver will normally drop each passenger off at each of their hotels in central London, which is really handy in my opinion. This option is also available to book from hotel to airport. Sometimes we need to travel from one London Airport to another. An option is to book a minicab by comparing minicab prices or using a shuttle bus. Gatwick, Heathrow and Stansted airports have dedicated express train services to central London. These trains are the Gatwick Express, the Stansted Express and the Heathrow Express, but you will be able to find more detailed information in this article if you continue reading. Besides these express trains there are other trains that connect these airports to central London, but they tend to take longer to get into central London, as some of them will have several stops before reaching central London. You can use Trainline to search for train tickets and routes. National Express runs daily from Heathrow, Gatwick and Stansted airports to central London. They offer comfortable coaches, plentiful space for suitcases and free wifi on board. Terravision runs daily from Gatwick, Luton and Stansted airports to central London, and is one of the most economical airport transfer companies. Here you can find a complete guide for London Airport Transfers to central London. London Stansted Airport is located approximately 50 kilometres north of central London, outside the London travel zones, and there are no direct links to London’s underground network. Options to get to central London from Stansted airport incude: Coach, train and private or shared airport transfers. Stansted airport train station is in the airport itself, and it is very easy to get to. You just need to follow the signs that indicate trains once you have reached the arrival terminal. The fastest train to get to central London from Stansted Airport is the Stansted Express. There is a train every 15 minutes from Stansted Airport, and it stops at Tottenham Hale and Liverpool Street Station in London. Both stations are inside London travel zone 1 and both of these stations are linked to London’s underground network. The Stansted Express train takes 36 minutes to reach Tottenham Hale and 47 minutes to reach Liverpool Street Station. You can buy tickets for the Stansted Express for a specific day, without having to choose a specific time, and take the train that suits you best on the day. If you buy a return ticket, the return ticket will be valid for one month from the departure date. You can buy the tickets online and then you simply need to enter the reference code in one of the self-service machines at the train station to pick up your train tickets. You can also buy train tickets using Trainline. National Express runs daily from Stansted airport to central London with stops in different central London locations such as Liverpool Street Station, Victoria, Paddington, Stratford and Waterloo. Each passenger can take up to two suitcases of up to 20 kg plus an item of hand luggage. This is the best coach in our opinion in terms of comfort and luggage capacity. Terravision is another coach company that runs daily from Stansted airport to central London, with stops at Baker Street, Liverpool Street Station, Stratford and Victoria. It is a well-known coach company for cheap airport transfers. As previously mentioned, booking a minicab is the best way to book private airport transfers from any airport in London to central London. Shared airport transfers from different London Airports to central London is a popular method of airport transfers. Many private transfer companies are offering this service, and basically they will have taxis, minicabs or even minibuses that make several trips from the different airports to central London throughout the day. If you choose this option, you may share the vehicle with other passengers who have also booked this option and need it for the same time, or you may find that no one else has booked that exact time and travel on your own. The driver will normally drop each passenger off at each of their hotels in central London, which is really handy in my opinion. This option is also available to book from hotel to airport. London Luton airport is located approximately 60 kilometres north of central London, outside the London travel zones, and there are no direct links to London’s underground network. Options to get to central London from Luton airport include: Coach, train and private or shared airport transfers. Luton Airport Parkway train station is 10 minutes away by shuttle bus from Luton airport. From Luton Airport Parkway train station there is a Thameslink train every 10 minutes and takes about 40 minutes to get to King’s Cross – St Pancras train station in central London. It also stops at Farringdon, City Thameslink and Blackfriars stations, so getting off at one station or another will depend on the location of your hotel. 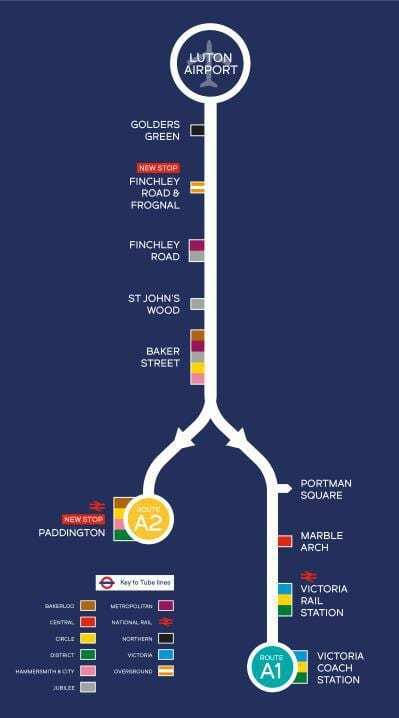 All stations are in London travel zone 1 and are directly linked to London’s underground network. National Express run daily from Luton airport to central London, stopping at Victoria and Paddington Stations. The coaches are extremely comfortable, with free wi-fi and each passenger can take up to two suitcases of up to 20 kg plus an item of hand luggage. This is the best coach in our opinion in terms of comfort and luggage capacity. The coach from Luton airport to central London takes approximately 1 hour and 30 minutes. Terravision also runs daily from Luton airport to central London, stopping at Bricket Wood, Brent Cross, Baker Street, Finchley Road, Marble Arch and Victoria. It is a well-known coach company for cheap airport transfers. Gatwick Airport is located approximately 45 kilometres north of central London, outside the London travel zones, and there are no direct links to London’s underground network. Options to get to central London from Gatwick airport include: Coach, train and private or shared airport transfers. Gatwick Express is the fast high-frequency direct train that runs from Gatwick airport to Victoria station in central London. There is a train every 15 minutes and the journey takes about 30 minutes. London Victoria station is in London travel zone 1 and is linked with London’s underground network. Southern Trains run every 15 minutes from Gatwick Airport to London Victoria Station, stopping at East Croydon and Clapham Junction. Southern trains usually take 10 minutes longer to get to Victoria than the Gatwick Express Trains. Thameslink Trains run every 15 minutes from Gatwick Airport to King’s Cross – St Pancras, stopping at East Croydon, London Blackfriars, City Thameslink and Farringdon train stations. 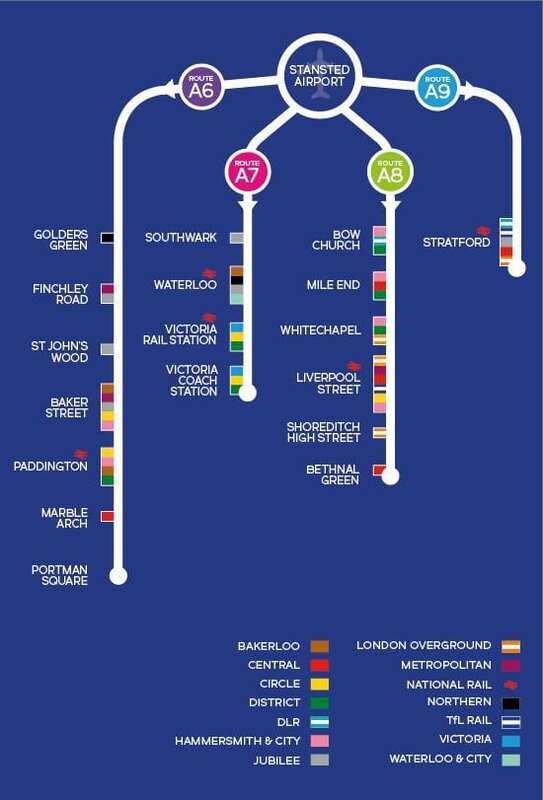 All these train stations are in London travel zone 1 and are linked to London’s underground network. This journey may take up to an 1 hour and 10 minutes. Although London Gatwick Airport is outside the London travel zones, it is possible to use a London Oyster card or a visitor oyster card on Gatwick Express, Southern Trains or Thameslink Trains. You can buy a visitor Oyster Card either online or when you arrive at Gatwick Aiport and use if for travel into central London. You can also use a contactless card for these journeys – just check your bank charges if you are not a UK resident though. National Express run daily from Gatwick airport to London Victoria, stopping at Lower Kingswood, Banstead, Belmont, Sutton Rail Station, Sutton Center, Rosehill, Mitcham, Streatham, Stockwell and Vauxhall. The coaches are extremely comfortable, with free wi-fi and each passenger can take up to two suitcases of up to 20 kg plus an item of hand luggage. Shared airport transfers from different London Airports to central London is a popular method of airport transfers. Many private transfer companies are offering this service, and basically they will have taxis, minicabs or even minibuses that travel frequently from different London airports to central London throughout the day. If you choose this option, you may share the vehicle with other passengers who have also booked this option and need it for the same time, or you may find that no one else has booked that exact time and travel on your own. The driver will normally drop each passenger off at each of their hotels in central London, which is really handy in my opinion. This option is also available to book from hotel to airport. Heathrow Airport is located less than 30 kilometers south of central London, in London travel zone 6, and directly linked to London’s underground network. Options to get to central London from Heathrow airport include: Underground (tube), coach, train and private or shared airport transfers. The Piccadilly Line is the underground line that connects Heathrow Airport to central London, and has several stops for the different airport terminals. Simply follow the signs to the underground. At any of Heathrow’s underground stations you will be able to buy single tickets, oyster cards or travel cards. We highly recommend that you buy an oyster card to get around London if you are planning a trip to London. Heathrow Express is a fast high-frequency train to London Paddington train station in central London (London travel zone 1). The journey takes about 20 minutes (much quicker than travelling by underground to central London) and trains run every 15 minutes. Heathrow Connect is another train that connects Heathrow Airpor with Paddington Train Station in central London, stopping at Hayes & Harlington, Southall, Hanwell, West Ealing and Ealing Broadway. The total journey time is approximately 30 minutes, but it is considerably cheaper than the Heathrow Express, especially if you buy train tickets a few weeks in advance. To buy tickets online simply enter Heathrow Airport as departure station, and Paddington as the arrival station, and we recommend taking the option of Anytime Return, which is usually the cheapest and allows you to take the Heathrow Connect at any time of the day and the return ticket will be valid for 1 month. It is possible to use a London Oyster card or a visitor oyster card on Heathrow Express Trains into central London. You can buy a visitor Oyster Card online or an oyster card when you arrive at Heathrow Aiport and use if for travel into central London. You can also use a contactless card for travel on Heathrow Express – just check your bank charges if you are not a UK resident though. National Express coaches run daily from Heathrow airport to central London. The coaches are extremely comfortable, with free wi-fi and each passenger can take up to two suitcases of up to 20 kg plus an item of hand luggage. Hello! We moved to London (Yes, the best city in the world) in 2010, and since then we have been discovering everything that this fantastic city has to offer. 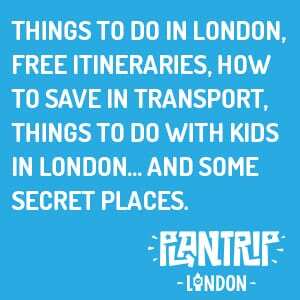 We regularly plan our friends’ trips to London, so we thought we would create PlanTripLondon.com and share our suggestions with the world for everyone to be able to plan the perfect trip to London! Hello! We moved to London (Yes, the best city in the world) in 2010, and since then we have been discovering everything that this fantastic city has to offer. We regularly plan our friends' trips to London, so we thought we would create PlanTripLondon.com and share our suggestions with the world for everyone to be able to plan the perfect trip to London! Hello! PlanTripLondon.com is a travel blog about London where you are going to find the most important things that you need to know to plan a trip to London. 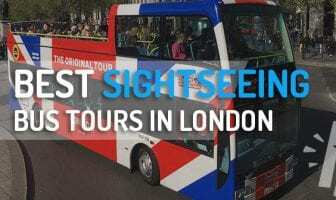 Our blog includes info and advice about Things to do in London, Itineraries, Recommended Hotels in London, Places to visit in London with kids and more! If you have any questions, leave a comment and we will try to help you in less than 24 hours! Copyright 2019 - All rights reserved | It is strictly forbidden to copy any texts or images from this Website.